Moving house can be much easier with the right moving company. As you prepare for your move, you’ll want to know the types of services they provide. Professional movers offer much, much more than just the hefty work. Are you having difficulty finding a way to get rid of that heavy armoire? Ask your mover if they offer disposal services. In most instances, this service can be completed the same day as your move. If your move only takes one day, they’ll pick up the piece, leave it on the truck and return it to their warehouse after your service is complete. From there, they’ll either donate or dispose the piece, depending on its condition. All moving companies offer packing services, but did you know they also offer unpacking? After moving day, the movers will return to your new home, unpack your boxes, and leave your items out for you to sort & organize. The best part of this service is that you won’t need to worry about throwing away your moving boxes. The movers will take the boxes & debris with them! This is a great service for anyone looking for an (almost) hands-free experience. Crating is different than packing and commonly used in long distance moves. Crating materials are much more durable than a standard moving carton. Usually, crates are custom built to secure artwork and ornate-framed items. Anything can be crated upon your request. If you’re a collector of antiques & irreplaceable pieces, make sure you’re hiring a company that offers this service and request it during your estimate. Sometimes, bulky items won’t fit through your door frames or stairwells. In this case, you’ll need a rigging service. Rigging is the process of hauling your goods out of a window or over a railing using ropes and cables. This is a labor and detailed-oriented process, so make sure your mover is experienced. If you listed your home with a realtor, they’ll recommend home staging for a quick sale. If you’re short on space, your mover can pick up your clutter before you make your move. They’ll store your goods in their warehouse until your home sells or you find a destination. Your homebuyers might ask you to clean your home prior to walkthrough. This could leave you with time restraints. 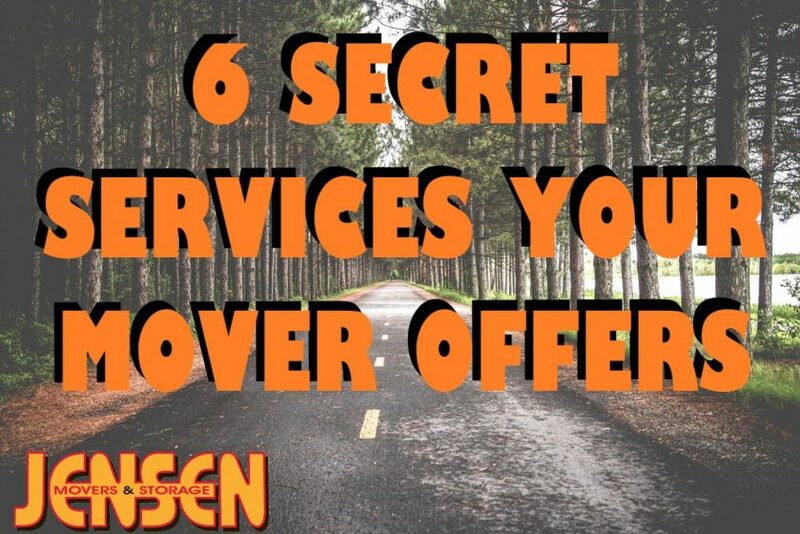 Your mover might be able to help with a service they call clean out. Like maid service, your movers will come in with their own cleaning supplies and make your old house presentable for walkthrough. They’ll haul away post-moving debris and get rid of those dust bunnies that collected behind your furniture. The pricing for these services range depending on the size of your home and contents. Think about these before your estimator arrives for the best idea on your final costs. Ready to schedule that estimate? Click here!